The level of childhood obesity continues to increase in England with the biggest rise seen among primary school children, according to a report published today by the Department of Health. New figures showed the prevalence of obesity among children aged two to 10 years old rose from 9.9% in 1995 to 13.7% in 2003. The biggest increase occurred among those aged from eight to 10 years old - from 11.2% in 1995 to 16.5% in 2003. The proportion of children who were either overweight or obese rose from 22.7% in 1995 to 27.7% in 2003, according to the study by the National Centre for Social Research. The research found a link between levels of deprivation and poor nutrition. Obesity rates were 5% higher among children living in deprived areas (16.4%) than those living in the least deprived areas (11.2%). A regional breakdown of obesity levels in 2001-02 revealed the highest rates in the north-east (18.3%) and in London (18.2%). The lowest levels were seen in Yorkshire and the Humber (11.4%) and the south-east of England (13.4%). Obesity was more common in children living in inner-city areas. The figures also showed that 19.8% of youngsters living in households where both parents were either overweight or obese were also obese, compared to 6.7% in homes where parents did not have a weight problem. Obesity levels were similar for boys and girls. In boys aged two to 10, levels rose from 9.6% in 1995 to 14.9% in 2003. For girls the rate rose from 10.3% to 12.5%. Last year the government published its public health white paper outlining measures such as increasing sporting activity in school"
A new cookbook by a fat vegan cook from Great Britain and his nutritionist wife proves how healthy and delicious it can be to be kinder to the planet and your tastebuds." Dutch have human "mad cow" case but say beef safe - Healthypages news: "The Netherlands reported its first human case of 'mad cow' disease on Thursday but said Dutch beef is safe to eat. " The interior ministry said in a statement a patient at a hospital in the central town of Utrecht had been diagnosed with variant Creutzfeldt-Jakob (vCJD), the human form of "mad cow disease". A classic case of being born in the wrong place at the wrong time. Please help stop this Bureaucratic needless slaughter..."Lincolnshire Lambs to be Lamb Chopped"
The Sun Newspaper Online - UK's biggest selling newspaper: "AN abattoir boss was last night trying to save two new-born lambs from the chop. David Wrights workers adopted the pair after they arrived unexpectedly as their mother was about to be killed. But bureaucrats have ordered that the animals called Mint and Sauce must be slaughtered because of strict hygiene rules. We will take this as far as we need to. The lambs are healthy and do not need to be killed. Workers at the abattoir in Boston, Lincs, also want to save the ewe who gave birth to the lambs last Wednesday night. David says the animals could easily be moved to a field where he keeps his own sheep. But officials from the Department of Food and Rural Affairs say the lambs should have been killed within 48 hours of arriving at the abattoir. Keeping them alive breaches rules designed to stop the spread of diseases like foot and mouth. David said: "If they want the lambs killed they should come here and do their dirty work themselves. This should be a special case. It's a one-off." To save the Lambs contact Hillside Animal Sanctuary who have offered Quarantine facilities. To get them to change their mind. Where burgers and nuggets once dominated, more than half of the customers are regularly ordering more balanced meals. "We've seen a visible change in our customers' eating habits which we can only assume is due, in part, to the Jamie Oliver programme," comments Suzanne Ryder, marketing manager at Brewers Fayre. Brewers Fayre's new children's menu, launched in June, will feature even more variety including dishes such as mashed potato with 'hidden vegetables'; carrot and swede, a miniature version of the Glamorgan vegetarian burger from the adult menu and a new cheese pasta. Mrs Ryder adds: "It's amazing that one young man has done more to improve the eating habits of a generation than the combined attentions of nagging parents and government advice - finally good food is cool for kids." DOH! Veganism is on the increase, vegetarianism is on the increase, food intolerances are on the increase, avoidance of highly processed ingrediance is increasing - Unilever bless them prove how out of touch they are with the market by introducing and egg replacer product that has not one but THREE key allergens in it - Soya, Dairy and even EGG!!. How can it be classed as an egg replacer if it contains egg?? As it's a unilever product it will almost certainly contain battery egg so it won't even be vegetarian. Egg replacer from Unilever food scientists moves into US market: "Gavin Heys, chief executive for Alleggra Foods. Alleggra, composed of soy protein, whey protein, vegetable oil (sunflower oil but can be varied) and egg white, was originally developed as a project within Unilever to design an anti-cholesterol egg replacer. UK ingredients firm Tate & Lyle came on board in September 2004 with a £1.6 million cash injection and a 15 per cent slice. The rest of Alleggra ownership is divided between Unilever and management. The GM-free product is marketed as a fully functional replacer of egg, and claims to have 75 per cent less saturated fat than an egg, with 10 per cent more protein. The price volatility of the European egg market over the past 18 months, in most part linked to the decimation of millions of birds through avian flu, has led to huge fluctuations in egg product prices. Food makers that use eggs extensively in applications from bakery to dressings, have seen margins sliced by the rises. Yolk prices, for example, rose from about £1700 a tonne in 2002, to £2250 in the last quarter of 2003 and have since dipped to around £1750 (£2524) a tonne. Evidence of the market potential for the egg replacer, according to the British Egg Information Service in the UK alone 32 million eggs are consumed a day: and per head per year, just over 20 per cent of these eggs are used in food processing. SocietyGuardian.co.uk | Health | Dr John Briffa: Gut reactions: FROM JOHN BRIFFA "Recently, I wrote a column regarding the singular lack of evidence proving that milk drinking is required for healthy bones in children, and highlighted the fact that the Milk Development Council (MDC) has recently been branded one of the United Kingdom's most useless quangos. I read that the MDC has just launched a scheme designed to urge girls to drink more milk. Apparently, the MDC is keen to promote the message that drinking milk helps prevent osteoporosis in later life, and goes even further by claiming that milk actually has beautifying properties for young girls. The MDC's 'Naturally Beautiful' campaign not only seems to overstate the value of milk in bone health, but might also be considered to be rather misleading regarding its potential effects on beauty. Some research, which was published earlier this year in the Journal of the American Academy of Dermatology, has actually linked milk consumption with a significantly increased risk of acne. The authors of this study hypothesise that this effect may be related to the presence of hormones and/or other biologically active substances in milk." Jesus was a vegan - Moses was a vegetarian - God is exasperated. Thou shalt not kill seems simple enough doesn't it? this is devon - news, entertainment, jobs, homes and cars: "In Gen 9:3, the later permission to eat flesh was issued solely as a concession to the barbarity of the day. Even then, it was only intended to be temporary and was issued with a curse, albeit a self-inflicted one, 'the blood of your lives shall I require' (it is striking to note how the lifespan of vegetarian Noah's meat-eating descendants plummeted). As for the Mosiac era, in the Gospel of Peace, Jesus says: 'God commanded your forefathers 'Thou shalt not kill', but their heart was hardened and they killed. Then Moses desired that at least they should not kill men and he suffered them to kill beasts, and then the heart of your forefathers was hardened yet more and they killed men and beasts alike. But I say to you, kill neither men nor beasts.'" Vegan Cooks for 150m BBC listeners. 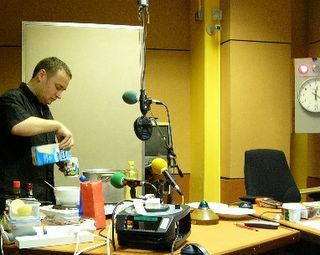 A Vegan cooks from his vegan cookbook for 150 million BBC world service listeners today as the media warms up for the Vegetarian Society's National Vegetarian Week. The BBC Worldservice Outlook team tasted a variety of vegan sausages, fishless salmon and tuna, dairy free cheese,and bacon from Redwoods and specially prepared dairy free egg free vegan orgasmic chocolate mousse. 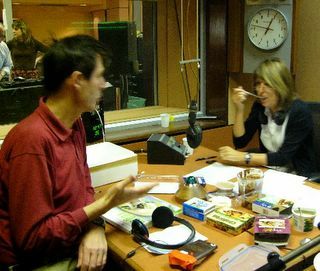 Tony Bishop Weston was invited to cook from his cook book vegan on a program about soya at the BBC's Bush house in London England. Hamlyn Vegan Cookbook $14.95 ISBN 0600611906 (USA) £12.99 ISBN 0600609154 (UK)available worlwide from Amazon and Borders and other bookshops. BBC Worldservice Outlook Team Try Vegan dairy free Chocolate Mousse from Vegan Cookbook. Cloned Meat and Milk just as bad. WASHINGTON (Reuters) - Meat and milk from cloned cattle are virtually identical to the same products from prize animals bred the old-fashioned way, researchers in Japan and the United States reported on Tuesday. While cautioning that their study is not the definitive report on whether it is safe to eat cloned animals, the researchers said it suggested they might be. Xiangzhong Yang of the University of Connecticut and colleagues at the National Institute of Agrobiological Science and National Institute of Animal Health in Kagoshima, Japan, cloned beef and dairy cattle and examined their meat and milk." ARS : News: "Nursing facility residents who consumed 200 International Units (IUs) of vitamin E daily for one year were less likely to get the sniffles than those who took a placebo. Scientists funded by the Agricultural Research Service (ARS) found that those who took the moderate supplements were 20 percent less likely to contract upper respiratory infections, such as colds. The study was led by Simin Nikbin Meydani, director of the Nutritional Immunology Laboratory at the Jean Mayer USDA Human Nutrition Research Center on Aging at Tufts University in Boston, Mass. The findings are important because, due to aging, the elderly have lowered immune responses and incur greater health risks from upper respiratory infections. The scientists studied 617 people over 65 years of age who met the study's eligibility requirements. All 451 participants who completed the study were residents in some type of long-term-care nursing facility located in or around the Boston area. About half of the participants were given the daily dose of 200 IUs of vitamin E; the remaining participants received a daily placebo capsule containing only four IUs of vitamin E. To help control other dietary factors that affect immune response, all participants received a capsule containing 50 percent of the recommended dietary allowance for essential micronutrients. Each volunteer was examined for health status on a weekly basis. Good dietary sources of vitamin E include certain cereals, wheat germ, nuts--especially sunflower seeds and almonds--leafy green vegetables and vegetable oils. The National Academy of Sciences has set an upper tolerable limit for vitamin E of 1,500 IUs a day. The study results were published in The Journal of the American Medical Association. Read more about this research in the April issue of Agricultural Research magazine." British Nutrition Foundation still a few vegetables short of a balanced dinner plate. Here is the dairy news - Health - Times Online: "Bridget McKevith, a nutrition scientist for the British Nutrition Foundation, says "Too high an intake of animal protein is known to affect bone health adversely,the same is true of highly processed foods and products that cause high levels of acidity, such as fizzy drinks." But McKevith and the majority of nutritionists remain cautious about the suggestion emerging from this research that it may be time to ditch the dairy, because full-fat milk is a "convenient source" of fat and calories for children under 12. " Dear me Bridget- have you seen the latest stats on childhood obesity and behaviour problems? Yes they need fat but its not SFAs they need it's EFAs. Wake up and smell the decaff it's about time you started recommending more green vegetables, sunshine, soya, hemp and flax! Time to forget about babies breast milk from another species and think about human nutrition! Too many kids are growing up to quickly reach the size of a small cow. The Tartan Online - USA - 25% college students wants vegan meals! According to a nationwide survey conducted by ARAMARK, a company that provides food to universities and school districts, one out of every four college students wants vegan meals. As a result, ARAMARK now offers dozens of vegan menu items, such as sweet Thai tofu stir-fry, vegan cheese quesadillas, faux chicken burritos, eggless “egg” salad and more, on select campuses.